Our sons enjoyed using this course. Customers tell us their sons like it, too. Use this course to teach your child to read for comprehension and to find answers to questions in the activities. Each Paradigm course is formatted in the same manner. If your student does well with one Paradigm course, he will probably like the others, too. Most question occur in the same order as they are found in the text. Each question is phrased from the text which is the old-fashioned way that worked. Introduces your student to reading to find the answer with a curriculum designed to do that. It’s a beautiful way to teach homeschool students who didn’t use a textbook approach in the elementary grades. It is available as a full course kit with the text, activities and teacher’s Resource Key in print or as a digital download. 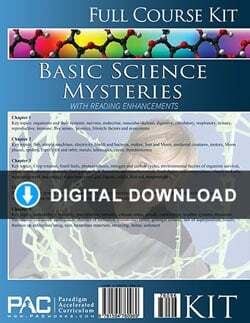 The Paradigm Basic Science Mysteries Digital Download Course Kit includes everything you need to complete the course in digital format: Text, Activities, and the Teacher’s Resource Kit, all in PDF format. Designed as a seventh-grade science course, Basic Science Mysteries cover earth and life sciences, plus studies on the Periodic Table of the Elements and the solar system. Meteorologists, humidity, precipitation, latitudes, climate zones, clouds, coalescence, weather systems, mountain formations, volcanoes, earthquakes, theories of formation, transitional forms, geologic column, law of superposition, fossils, theories on extinction, smog, rain, hazardous materials, recycling, deltas, sediment. 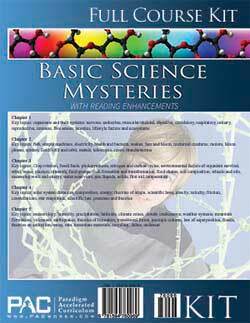 The Paradigm Basic Science Mysteries Text Booklet Set includes one of each of the text booklets for Chapters 1 to 5 for the extra student. 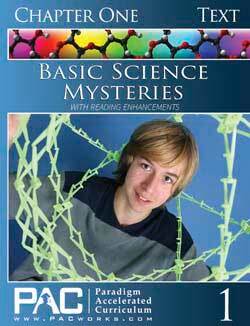 The Paradigm Basic Science Mysteries Activity Booklet Set includes one of each of the activity booklets for Chapters 1 to 5 for the extra student. 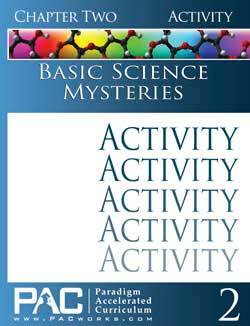 The Paradigm Basic Science Mysteries Teacher’s Resource Kit (TRK) has the Activity Keys, Quizzes, Quiz Keys, Tests, and Test Keys.